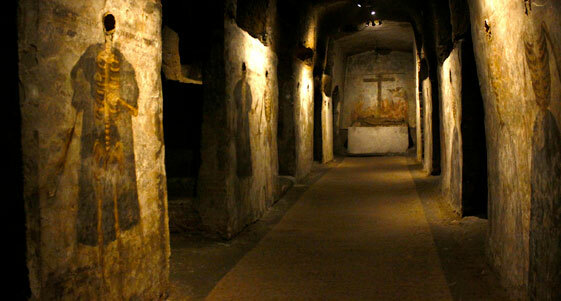 Under the Basilica of Santa Maria della Sanità, the neuralgic centres of the district, we find the second most important early Christian cemetery in the city. 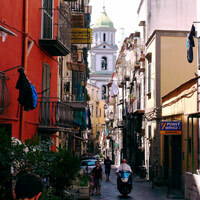 The valley that is now one of the most densely populous neighbourhoods in Naples, was once a necropolis and burial ground. Hellenistic hypogeums were built in this area, and later, early Christian catacombs, like those of San Gennaro and San Gaudioso. From the 17th century, the area was called "Sanità" (health) because it was considered pristine and healthy, also due to miraculous properties attributed to the presence of the tombs of the saints. 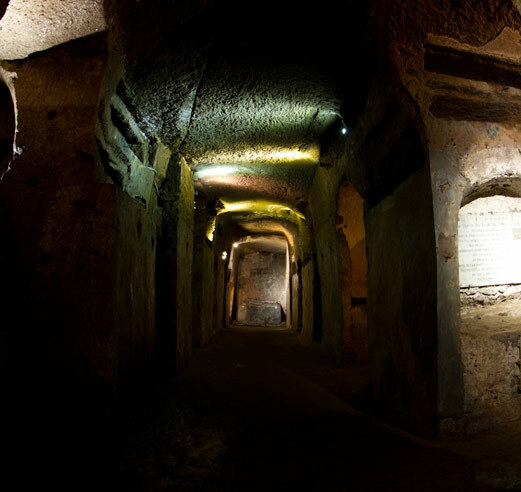 There are nine catacombs and cave complexes under the Rione Sanità, and only San Gennaro, San Gaudioso, San Severo and the more recent Fontanelle ossuary have been unearthed. 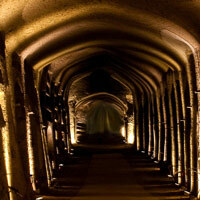 Have you been to the Catacombs of San Gaudioso? Your ticket to visit San Gennaro is valid for 12 months. was bishop of Abitina, in Tunisia. He arrived in Naples through a fortuitous event: after the invasion of the Vandals, he refused to convert to Arianism, so king Genseric had him placed on a ship without sails or oars, along with other exiled Christians, including Quodvultdeus, bishop of Carthage (buried in the Catacombs of San Gennaro). St. Gaudiosus bishop of Abitina. When he died, between 451 and 453 AD, he was buried in the cemetery outside the city walls of Naples, and his place of burial soon began to arouse devotion. From that time onwards, the early Christian underground cemetery expanded and gradually became the Catacombs of San Gaudioso. 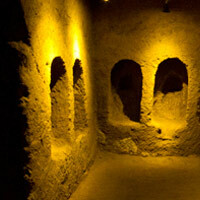 The first part of the catacomb was built between the 4th and 5th century AD. 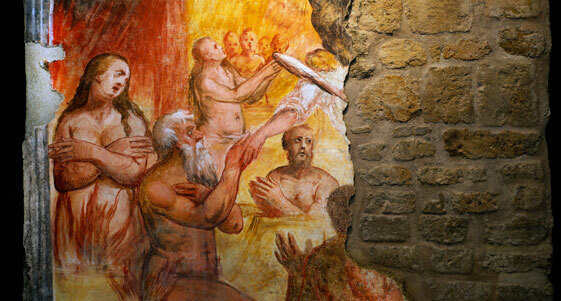 The Catacombs were extended following the burial of the North African bishop, deposited here between 451 and 453 AD. 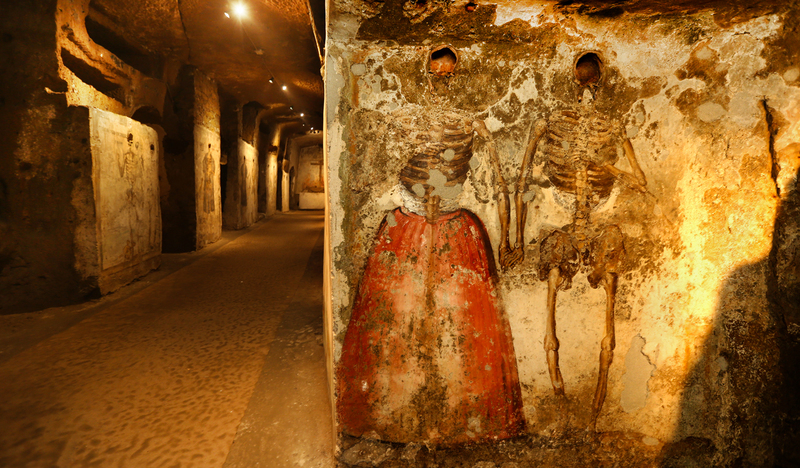 The Catacombs of San Gaudioso are the second largest in Naples, and includes both early Christian and 17th century elements. The entrance is inside the Basilica Santa Maria della Sanità, beneath the main altar. On one side there is the intensity of the early Christian elements, such as the tomb of St. Gaudiosus and frescoes and mosaics of the 5th and 6th centuries, and on the other, the special graves reserved for nobles, dating back to the 17th century, when the catacombs resumed the function of a burial site. 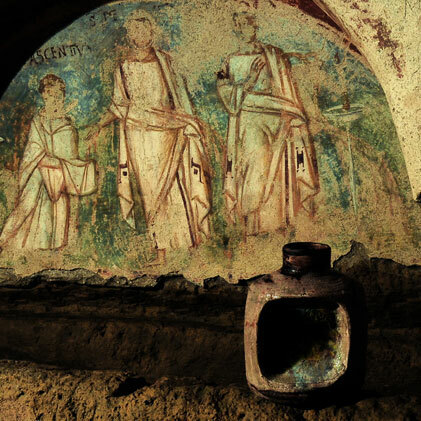 The Catacombs of San Gaudioso conserve valuable frescoes and mosaics from the 5th and 6th centuries that feature many symbols that were widely used in the early Christian era, such as the fish, the lamb, and grapes with branches. 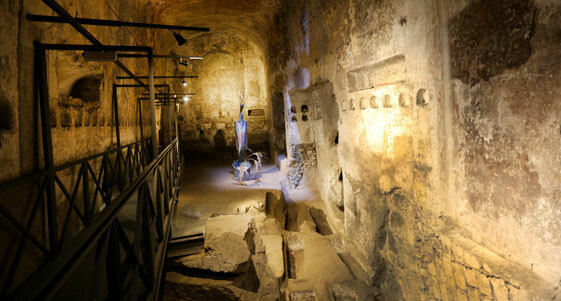 However, it is difficult to determine with certainty the extent and the number of the chambers, due to the numerous transformations undergone by the Catacombs: once they were abandoned, the 'Lave dei Vergini' invaded and obstructed the access, while other parts were modified or filled in for the construction of the Basilica. The fresco, dated to the 5th/6th century, may represent a scene of welcome. Its centre is dominated by the figure of theApostle Peter, who is introducing the deceased Pascentius to a third person, either Christ or most probably St. Paul. Another interesting element is the presence of two candlesticks with burning candles placed the side of the figures, frequently found in many African representations. During the Late Middle Ages, the entire cemetery area began to be progressively abandoned. 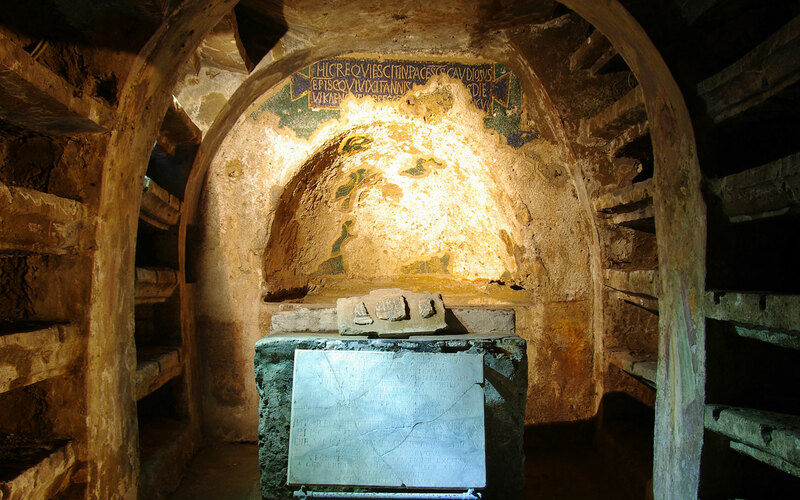 In the Late Middle Ages, the catacombs were gradually abandoned by the faithful and pilgrims, due to mudslides and debris coming down from the hills and the theft of the relics of St. Januarius, which led to the transfer of the remains of other saints to within the walls. The ancient cemetery area remained abandoned during the years of the Late Middle Ages, partly due to the landslides that engulfed the area: mudslides and debris produced by the erosion of the surrounding hills. Until the 1960s, the district continued to be engulfed by rivers of mud and debris, known as the Lave dei Virgini, which invaded the streets of the district due to the severe lack of drainage, forcing local residents to take refuge on the upper floors of buildings. The central Ambulatory is 30 m long, 2.3 m wide and houses 13 cubicles. 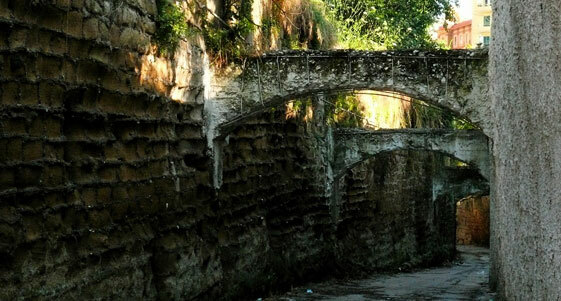 The Cisterna ("Tank") is 25 m long and 8-10 m in both width and height. 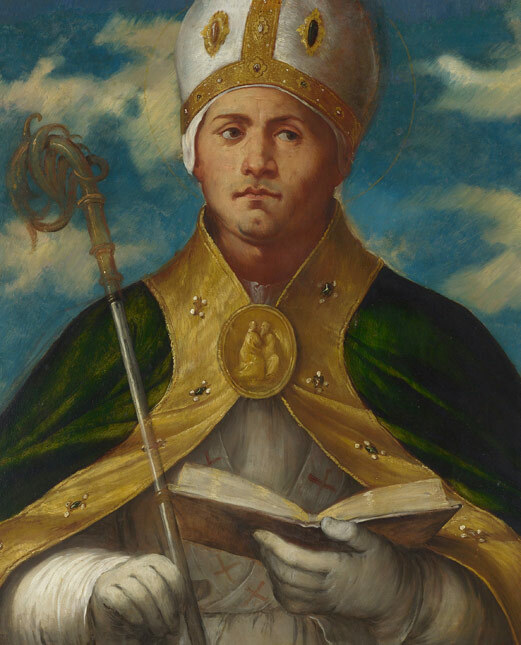 Following the theft of the remains of San Gennaro by Prince Sicone I, who brought them to Benevento, there was fear concerning the theft of other relics of saints and bishops buried outside the city walls. Therefore, in the 9th century, the remains of saints, including St. Severus and St. Gaudiosus, were safely placed within the walls of Naples. 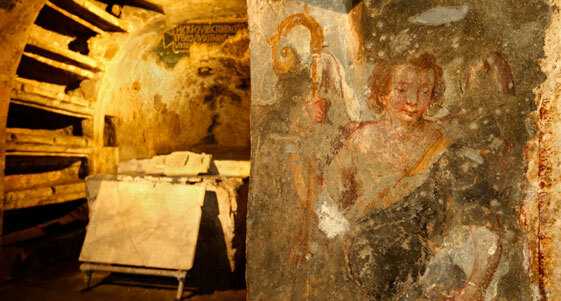 The catacombs of San Gaudioso returned to use as a burial site in the 16th century, after the discovery of a fresco of the Madonna that had been previously concealed by mud. 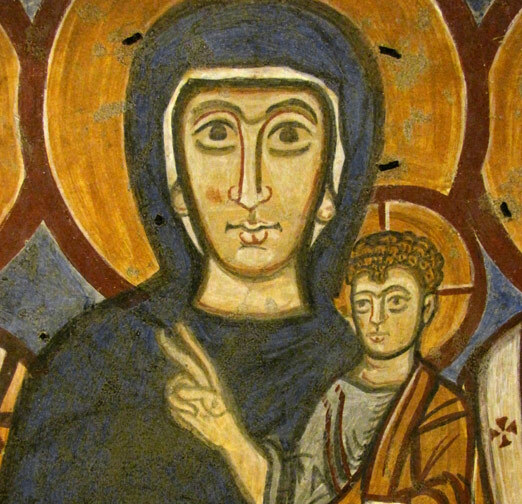 The Madonna della Sanità, from the 5th-6th century, is the oldest depiction of the Virgin Mary in Campania. Now there's a district characterised by contradictions and a vast cultural heritage. incorporate them into the building. During the 17th century, the site mainly contained graves for aristocrats and the clergy. The tombs of the nobles and clergy were created following a special procedure. The skulls were placed on display in the walls of the ambulatory, while the rest of the body was frescoed, usually with the clothes and professional instruments that represented the social status of the deceased. 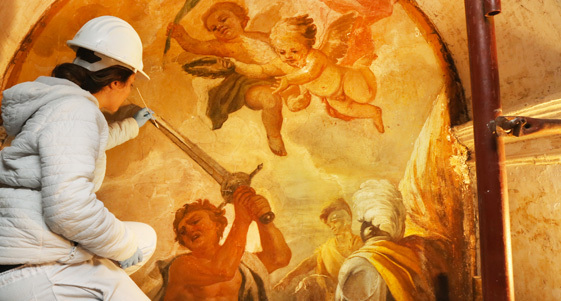 The frescoes were painted by Giovanni Balducci, an artist who refused payment in order to be buried among the aristocrats in the Catacombs of San Gaudioso. 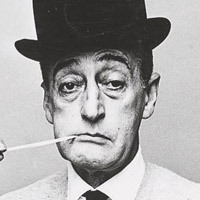 1964 Totò composed the poem 'A Livella in Neapolitan dialect. 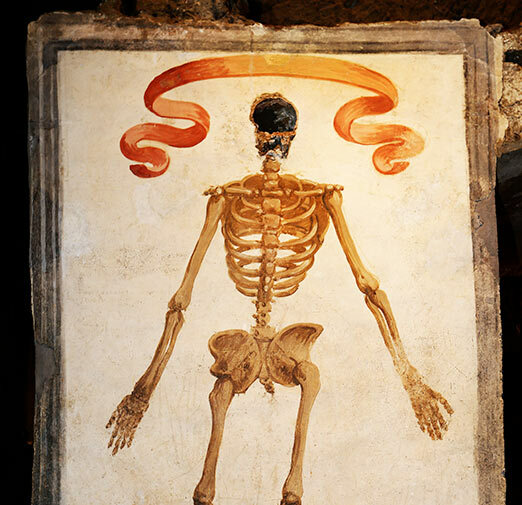 It is said that he was inspired by one of the frescoes, representing death that conquers all. The burial of nobles and clergy involved the practice of draining. Draining was a process in which corpses were placed in niches so that they would lose their fluids. "Puozze sculà! ", or "may your life drain away ", i.e. may you die. This process took place in small cavities called seditoi, drainers or in Neapolitan cantarelle, from the Greek canthàrus, due to the vessel placed under the deceased, which had the function of collecting the cadaveric fluids. Once the process was complete, the bones were washed and finally laid to rest. This macabre task was performed by a figure called a schiattamuorto. The profession of the "schiattamuorto"
The schiattamuorto had the task of placing the corpses to drain, carefully creating holes in the bodies in order to facilitate the desiccation process. Today, even though the tasks have changed, an undertaker is still called a schiattamuorto. 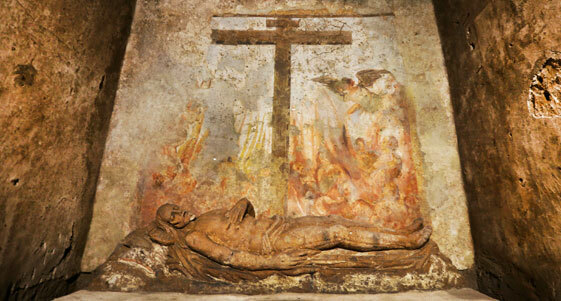 The spaces in the catacombs, although large, were nevertheless cramped and unhealthy, due to the draining. The few openings in the Catacombs of San Gaudioso included trap doors that led to the crypt, but these were only opened during funeral rites, so that the deceased could be placed in the drainage niches. This meant that the schiattamuorti worked in appalling conditions of hygiene and were inevitably destined to fall ill.
"Down here, do you see, we are both the same? You're dead and so am I; each of us is the same as the other." Totò was born in Via Santa Maria Antesaecula, not far from the Catacombs of San Gaudioso. Antonio was born in circumstances of severe economic and family hardship. Born from a secret affair, his father, the marquis Giuseppe De Curtis, initially refused to acknowledge him. 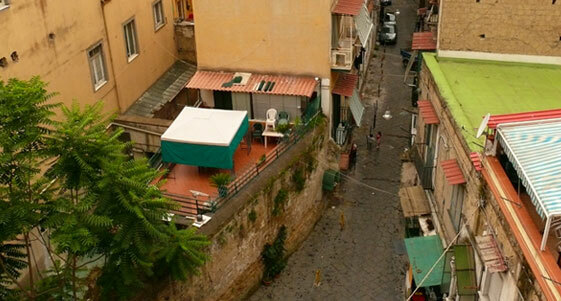 The family was only reunited in the early 1920s, and then moved to Rome. The Prince never forgot his beloved district. Every now and then, he would walk through the streets of his neighbourhood at nighttime, leaving ten thousand lire notes under the doors of the most needy families. The bond with his neighbourhood was so strong that when he died, after a funeral in Rome and in Naples, a third one was held in Rione Sanità. 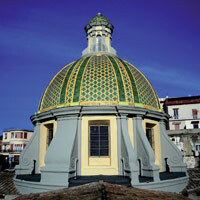 Discover the treasures of Santa Maria della Sanità, on Sundays (booking in advance). The Teniamo in Vita il Passato ("Keep the Past Alive") adoption campaign aims to promote artistic and monumental heritage, as distinctive signs and unique documents of the local area. 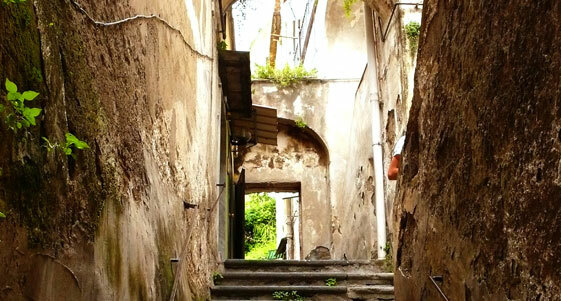 In these years, we wanted to launch a campaign to sponsor the restoration of Rione Sanità, Teniamo in Vita il Passato, addressed to everyone willing to commit their own resources for the sake of the common good. 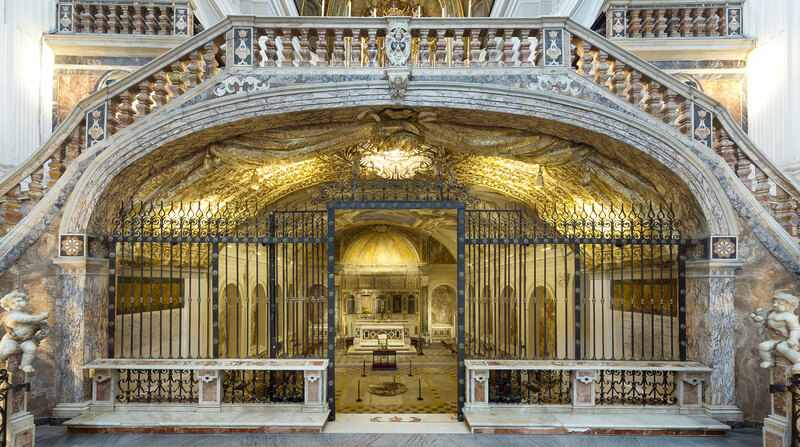 The campaign started with the Catacombs of San Gennaro, and then continued in the Catacombs of San Gaudioso with the restoration of the Byzantine Madonna and the main ambulatory of the Catacombs of San Gaudioso. The Byzantine fresco of the Madonna. The Byzantine fresco depicting the Madonna and Child between two Holy Bishops dates from the second half of the 9th century AD, and was painted shortly before the "Lave dei Vergini" blocked the ancient cemetery church. 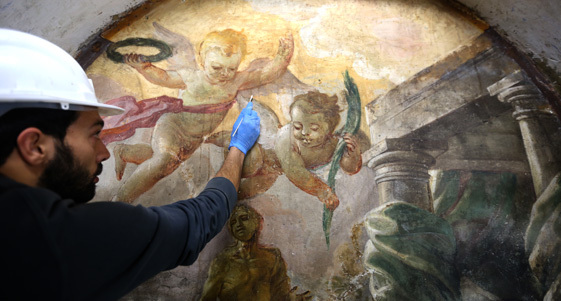 The fresco, hidden by a nineteenth-century painting of San Gennaro, was rediscovered by chance in 1991 and finally restored in 2011. The restoration projects have so far involved the participation of the State Attorney General Vincenzo Galgano, the Group of Young Entrepreneurs of the Industrial Union of Naples, the ACEN Youth Group, theUnion of Young Chartered Accountants of Naples (UGDC), the Art Raising Association, Di Fiore Photographers, Poste Italiane S.p.A., Parmacotto. 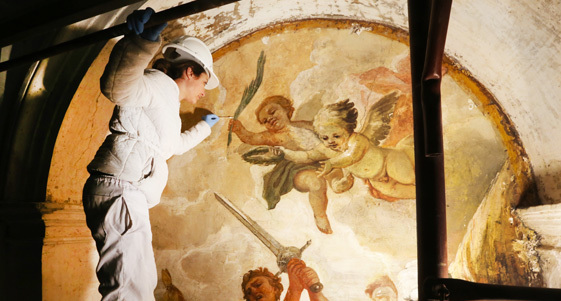 The Sacred Cave was brought back to life by an intense restoration activity, which started in the spring of 2017 and set a new milestone in the recovery process of the Rione Sanità. In the beginning, the crypt was a small church that had been created in the main ambulatory of the Catacombs of San Gaudioso. 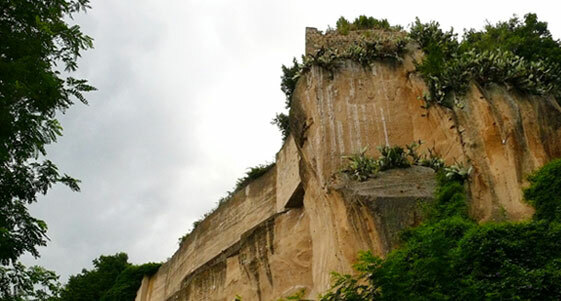 The deposition of San Gaudioso drew a large number of pilgrims, but it was abandoned as soon as they were moved within the city walls after the remains of San Gennaro were stolen. In the 9th century the church was covered in mud by the "Lave dei Vergini", to then become the cellar of a rural house in the 16th century. The worship was reestablished only after recovering the ancient entrance to the cave. 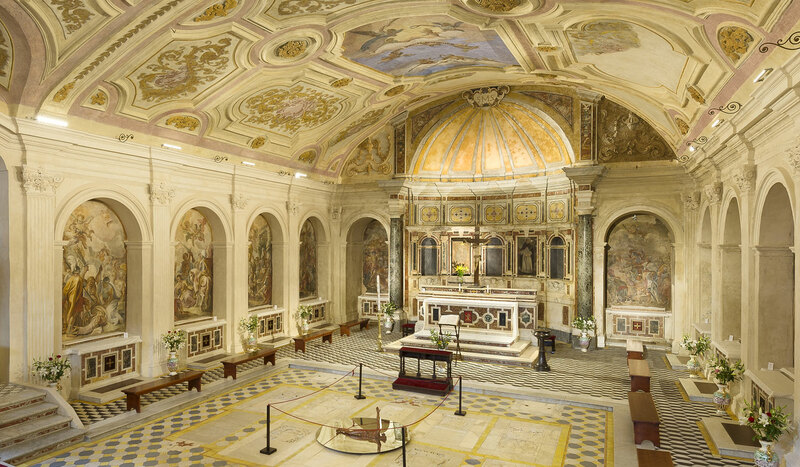 From the 17th century on, the crypt underwent many changes due to the building of the Basilica of Santa Maria della Sanità, such as the reconstruction of the high altar and ten side-altars. 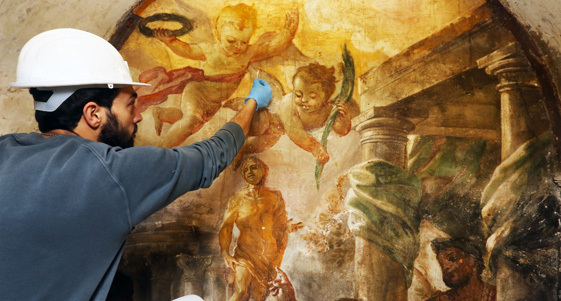 The altars and their frescoes by Bernardino Fera, a pupil of Solimena, have all been restored in May 2017. The frescoes depict the martyrdom of early Christian saints, echoing Classicism with recurrent themes such as the contrast between the harshness of the oppressor and the emotional force of the martyrs. Over the last few months, the restoration works also involved the 1800s frescoed vault and the majolica floor tiles.